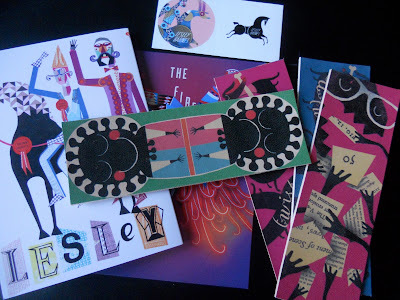 I mentioned in my Happy List post that I was feeling rather excited about a package on it's way from Lesley Barnes' shop! And today it's here! A wonderful and bright way to start the weekend! As I suspected, I was not at all disappointed. Her work is lively, bold, exciting and colourful. It always cheers me up and makes me want to get some more colour in my illustrations. In fact, I plan to do this. I was really happy with the colour in my Company illustrations and plan to keep this up! (Especially since these pieces were the ones that drew my agent to me!) Below is my lovely package! 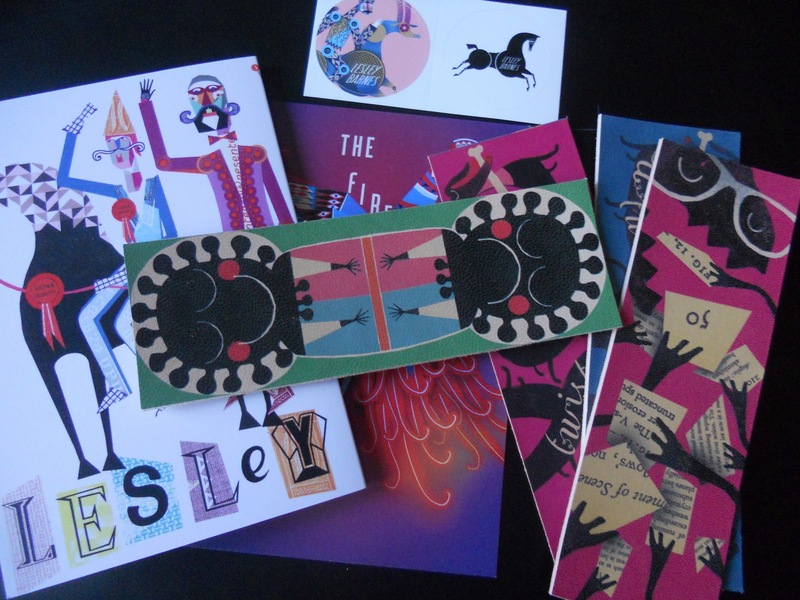 I ordered a set of 4 bookmarks and Lesley was kind enough to send some little extras. I especially love the Two Face - happy/sad bookmark and the cat riding on the horse. So sweet! Lesley has been so kind and supportive to me and we both did work for the V&A for the same project (my first commission!) You should definitely have a look at her shop - these made my day!